Please join the Reiss Center on Law and Security, together with the NYU Program in International Relations, for this event. Books will be available for purchase. Jason Rezaian, former Tehran Bureau Chief for the Washington Post, will discuss his 2014 arrest and subsequent captivity in Iran’s notorious Evin prison and the complex, sustained efforts required to secure his release amidst high-stakes nuclear negotiations between the U.S. and Iran. Rezaian recounts his journey in his new book, Prisoner: My 544 Days in an Iranian Prison. 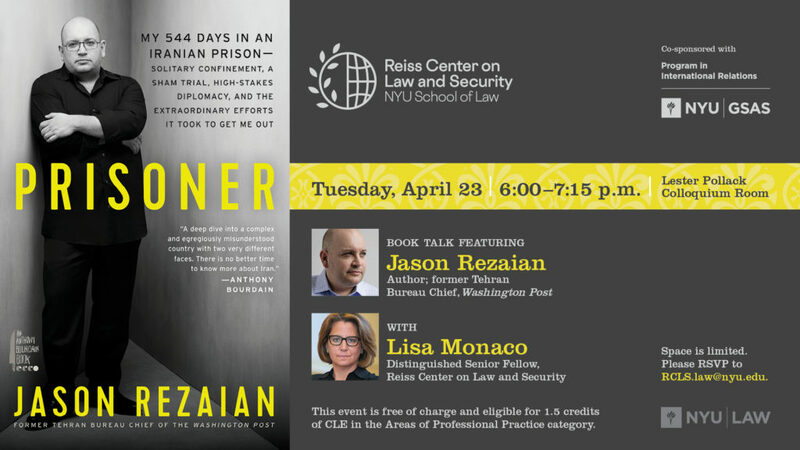 Rezaian will be joined in conversation by RCLS Distinguished Senior Fellow Lisa Monaco, who served in the White House as Homeland Security Advisor to President Obama at the time of Rezaian’s detention and the efforts to secure his release. 1.5 credits of CLE in the Areas of Professional Practice category (transitional and non-transitional) will be available. Please see below for description, speaker bios, and CLE reading materials. In the conversation with Rezaian and Lisa Monaco, former Homeland Security Advisor to President Obama, attorneys will learn about the international legal and foreign policy issues around Rezaian’s detention and the negotiations for his release – including the parallel international nuclear agreement and resolution of the legal cases and termination of the extradition requests for Iranians that figured in the release of Rezaian and his fellow Americans held by Iran. Jason Rezaian is one of the few Western journalists to have been based in Tehran in recent years. From 2009 until his arrest in 2014, he covered stories that tried to explain Iran to a general American audience, first as a freelancer for a variety of outlets and later as The Washington Post’s Tehran bureau chief. He reported on two presidential elections, Iran’s nuclear negotiations with global powers, the effects of one of the most punitive sanctions regimes in modern times, and environmental issues. In between those momentous topics, he told the stories of everyday Iranians which sought to make them more accessible to readers, reporting on Iran’s small community of baseball players, the quest for the best high-end hamburger in Tehran, and a clinic for female drug addicts. In July of 2014, Rezaian and his wife were detained in their home and he went on to spend 544 days in Tehran’s Evin prison, released on the same day that the historic nuclear deal between Iran and world powers was implemented.